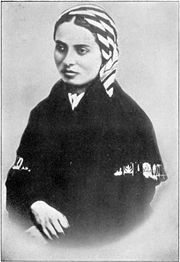 Saint Bernadette Soubirous (January 7, 1844 – April 16, 1879) was a shepherd girl from the town of Lourdes in southern France. She was canonized as a saint by the Roman Catholic Church on December 8, 1933. From February to July 1858, Bernadette reported 18 apparitions of the Virgin Mary. Despite initial skepticism from the Catholic Church, these claims were eventually declared to be worthy of belief after a canonical investigation. The phenomenon made the town of Lourdes a major site for pilgrimages and attracts millions of Catholics each year. St. Bernadette’s annual feast day is April 16. Bernadette was the daughter of François Soubirous (1807 – 1871), a miller by trade, and his wife Louise nee Castérot (1825 – 1866), a laundress. Bernadette was the eldest of six children. Bernadette was a sickly child; she had cholera in infancy and suffered most of her life from asthma. When hard times fell on rural France the family lived in extreme poverty. Despite the hardships, neighbors reported that the family lived in unusual harmony, apparently relying on their love and their religious devotion for support. All the family members sought what employment they could. Bernadette did farm work, notably sheep herding, for a family friend in nearby Bartrès. She also waited tables in her aunt Bernarde's tavern. Bernadette returned to Lourdes in January 1858 to attend the free school run by the Sisters of Charity and Christian Instruction in order to finish learning the Catechism and receive her first Holy Communion. However, she struggled in her classes and suffered as a student. Since her classes were taught in classic French rather than the local Gascon language, it is likely Bernadette was not the only student with learning difficulties. Her struggles in school were attributed at the time to simple-mindedness; in later hagiographies they seemed to illustrate her innocence. On February 11, 1858, at age 14, Bernedette, her sister, and a friend were out gathering firewood at the grotto of Massabielle outside Lourdes. It was there that Bernadette claimed to see the first of 18 visions. She termed the apparition "a small young lady," which was standing in a niche in the rock. The other girls stated that they saw nothing. The apparition did not identify herself until the 17th vision, and until then Bernadette called her simply 'Aquero' or 'it' in the Gascon language. As Bernadette later reported to her family, her church, and several civil investigators, in her ninth vision the lady told her to drink from the spring that flowed under the rock. However, there was no known spring there and the ground was hard and dry. Bernadette assumed the lady meant that the spring was underground so she began to dig into the dirt. Soon a small puddle appeared and a day or so later, a spring began to flow. Not long afterward, it was recorded as being 3.5 meters high. This miraculous spring became associated with healing and is said to have cured many illnesses. Pilgrims flocked to drink and touch its waters. The Lourdes Bureau, the official medical board of Lourdes, was made up of both Catholic and atheist physicians. They stated that most reported cures took place during or after the Blessing of the Eucharist procession rather than after bathing or drinking. They noted that the water of the spring did not seem to contain any special chemical compounds or healing tonics that would make it capable of producing the cures associated with it. In the years since Bernadette dug up the spring, 67 cures have been verified by the Lourdes Bureau as inexplicable, not miraculous. Today, even after extremely rigorous scientific and medical examinations, no one can explain these healings. Bernadette herself said that it was faith and prayer that cured the sick. Bernadette's other visions of the lady focused on the need for prayer and penance. However, on March 2, 1858, after the 13th apparition, Bernadette told her family that the lady had said, "Please go to the priests and tell them that a chapel is to be built here. Let processions come hither." Accompanied by two of her aunts, Bernadette accordingly went to parish priest Father Dominique Peyramale with the request. A brilliant but often rough-spoken man with little belief in claims of visions and miracles, Peyramale told Bernadette that the lady must identify herself. Bernadette said that on her next visitation she repeated the Father's words to the lady, but that the lady bowed a little, smiled and said nothing. Her 16th apparition, which she claimed lasted for over an hour, was on March 25, 1858. During this vision, the second of two “miracles of the candle” was said to have occurred. Bernadette was holding a lighted candle; during the vision it burned down, and the flame was said to be in direct contact with her skin for over 15 minutes but she showed no sign of experiencing any pain or injury. This was claimed to be witnessed by many people, including the town physician, Dr. Pierre Romaine Dozous, who timed and later documented it. According to his report, there was no sign that her skin was in any way affected. He monitored Bernadette closely but did not intervene. After her vision ended, the doctor said that he examined her hand but found no evidence of any burning. She was completely unaware of what had been happening. The doctor then said that he briefly applied a lighted candle to her hand. She reacted immediately. According to Bernadette's account of that same visitation, she again asked the lady her name but the lady just smiled back. She repeated the question a further three times, and finally heard the lady say, in the Occitan language, "I am the Immaculate Conception." Four years earlier, Pope Pius IX, had shared the doctrine of the Immaculate Conception: of all human beings who have ever lived, Mary, the mother of Jesus, alone was born without the stain of original sin. However, this was not well known to Catholics at large at that time. It was generally confined to discussion amongst the clergy. Certainly it was not an expression known to a simple peasant girl who could barely read. Her parents, teachers and priests all later testified that she had never previously heard the words 'immaculate conception' from them. Some of the people who interviewed her about the visions thought she was simple-minded. Yet despite being rigorously interviewed by officials of both the Catholic Church and the French government, she stuck consistently to her story. Her behavior during this period set the example by which all who claim visions and mystical experiences are now judged by Church authorities. Disliking the attention she was attracting, Bernadette went to the hospice school run by the Sisters of Charity and Christian Instruction. It was there that she finally learned to read and write. She then joined the Sisters of Charity abbey and moved into their motherhouse at Ners when she was only 22 years old. She spent the rest of her brief life there, working as an assistant in the infirmary and later as a sacristan. Bernadette created beautiful embroideries for altar cloths and vestments. She had followed the development of Lourdes as a pilgrimage shrine while she still lived at Lourdes, but was not present for the consecration of the Basilica there in 1876. She eventually died of her illness at the age of 35 on April 16, 1879. Bishop Gauthey of Nevers had the body of Bernadette Soubirous exhumed on September 2, 1909, in the presence of representatives appointed by the postulators of the cause, two doctors, and a sister of the community. They found that although the crucifix and the rosary in her hand had both oxidized, her body appeared to be preserved from decomposition. This was cited as one of the miracles to support her canonization. They washed and re-clothed her body before burial in a new double casket. The church exhumed the corpse a second time on April 3, 1919. The body still appeared preserved; however, her face was slightly discolored possibly due to the washing process of the first exhumation. In 1925, the church exhumed the body for a third time. They took relics from the body, which were sent to Rome. A precise imprint of the face was molded so that the firm of Pierre Imans in Paris could make a light wax mask based on the imprints and on some genuine photos. This was common practice for relics in France, as it was feared that although the body was mummified, the blackish tinge to the face and the sunken eyes and nose would make an unpleasant impression on the public. Imprints of the hands were also taken for the presentation of the body. The remains were then placed in a gold and glass reliquary in the Chapel of Saint Bernadette at the motherhouse in Nevers. The site is visited by many pilgrims. St. Bernadette received beatification in 1925 and canonization in 1933 under Pope Pius XI, not so much for the content of her visions, but rather for her simplicity and holiness of life. She is the patron saint of sick persons and of Lourdes. Franz Werfel's novel The Song of Bernadette, was based on a fictionalization of St. Bernadette’s life. The book was later adapted into a film of the same title in 1943, starring Jennifer Jones as Bernadette and the unaccredited Linda Darnell as the Immaculate Conception. Jones won an Academy Award for her portrayal of the saint. A more historically accurate version of Bernadette's life is presented in the 1988 film Bernadette and the 1989 The Passion of Bernadette by Jean Delannoy, starring Sydney Penny in the lead role. There is also a 2011 French film Je M'appelle Bernadette starring Katia Miran. Matthew James Publishing. The Song of Bernadette Retrieved May 16, 2007. Teller, Woolsey. The Miracle Joint at Lourdes Retrieved May 16, 2007. All links retrieved January 18, 2013. This page was last modified on 30 January 2013, at 17:33.